Most of us in the room during Silver Peak’s presentation were network engineers building high quality, fault tolerant networks, and we were familiar with the pain SD-WAN seeks to address. As a brief overview, Software Defined WAN reduces the complexity and improves the performance of the WAN edge by adding optimization, automation and measurement-based exterior routing. This approach offers fault tolerance for all types of failures from the link itself through the public cloud. This means that the complexity associated with current technologies such as DMVPN, IP SLA, and PfR is largely eliminated. This also means that a type of QoS can be delivered even on public WAN links. And this means significant cost savings by eliminating expensive private MPLS links. Several vendors are already doing this, so the technology isn’t brand new. I wasn’t necessarily skeptical walking into Silver Peak’s offices, but I wasn’t expecting anything groundbreaking. Their presentation was very compelling, though, and I was impressed with David Hughes’ ability to jump in, as Founder and CEO, and dig into the technology. He explained that the impetus to move to SD-WAN is the shift to cloud applications, and that their product delivers applications with high quality over whatever connectivity the user chooses. He also explained that their solution meets a specific use case: “to connect users to applications much more easily, efficiently and cost-effectively.” In David’s words, Silver Peak’s technology is more about “providing an overlay over whatever underlying technology you want to use for your connectivity…and making that overlay really easy to manage and deploy.” Flexibility and ease of use seem to be key to Silver Peak, which is, of course, a good thing. Damon Enniss, Senior VP of Products, presented their Unity EdgeConnect solution to easily harden the WAN edge and deliver path conditioning, latency mitigation and increased reliability. I’ve struggled with providing this level of cost-effective optimization and fault tolerance to the WAN edge. Especially in the small to medium sized business space, organizations can’t always afford the hardware or skillset to implement the design they need. Though their requirement for uptime and a quality connection is no less important, the cost can be prohibitive. Silver Peak did a great job, but then again I’m already excited about this technology. Zero-touch provisioning for highly resilient WAN edge devices? Sign me up! It makes sense, especially in the SMB space, because there’s an actual business use case for this. The most compelling value proposition to me is that using this technology means I can get rid of all my private connections. I want to ditch my expensive private MPLS link and have a pair (or three) of public internet connections. My MPLS links can cost thousands of dollars per month each. Silver Peak says they can deliver performance, quality and resiliency and cut costs up to 90%, so the real value proposition is going with all public connections. Damon mentioned that only in passing, but I think it’s the most compelling reason to go SD-WAN with Silver Peak. Over the last few years I’ve noticed ISPs improving their service delivery, and even though I still tease about Time Warner Cable going out when it rains, business internet connectivity has increased in quality and bandwidth and decreased in cost. There are parts of the country and world where internet connectivity is still very poor, but in the northeast where I live, I can run voice over the internet today when I wouldn’t dare 5 years ago. I want to drop the hybrid solution and go SD-WAN with all public internet links. Cheaper, easier to deploy, and easier to switch ISPs if I want. To me that’s the real value of SD-WAN. Silver Peak didn’t make that specific case very strongly, and I think they should have. An organization may require a hybrid model for some particular reason, and I understand that. But by and large, Silver Peak’s technology can provide to even the smallest customer private line performance and reliability cheaper with public internet connections only. Win. 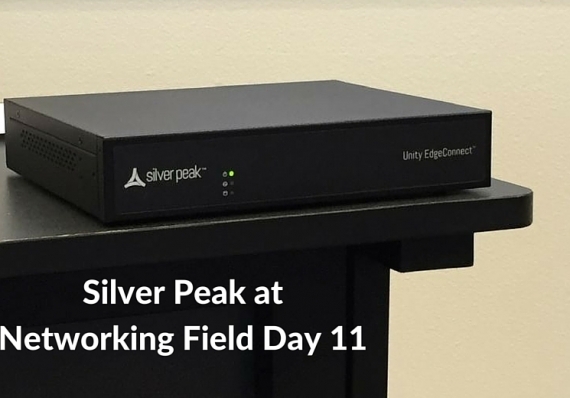 I attended a Silver Peak presentation as an invited delegate to Network Field Day 11. The sponsors pay to present to the NFD delegates, and in turn that money funds my transport and accommodation while I am there. That said, I don’t get paid anything to be there, and I’m under no obligation to write anything, positive or negative, about any of the presenters.